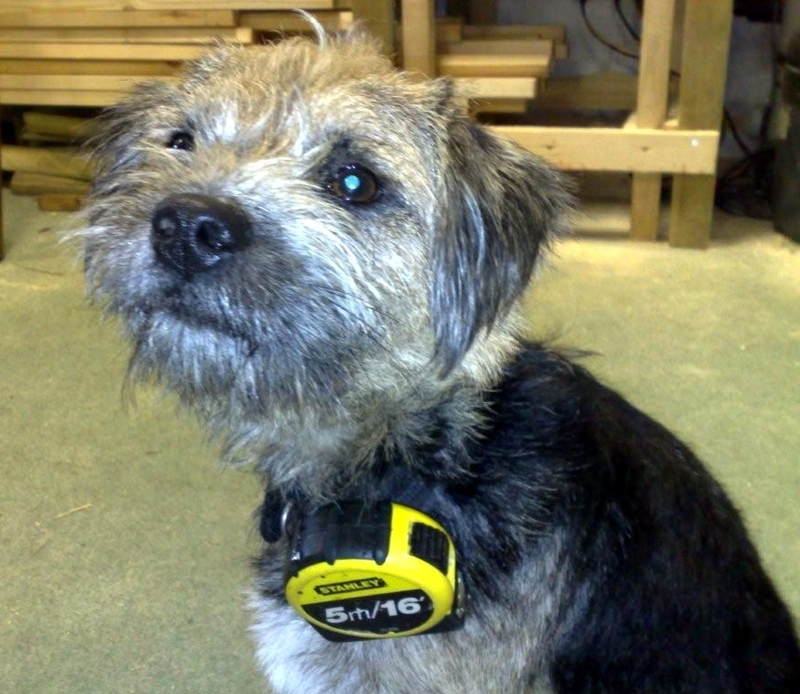 This page is about Biff, a Border Terrier who works (allegedly) at woodenart. We are pleased to announce a new addition to the woodenart team. Biff brings a wealth of inexperience, no track record, expensive vet bills, chewed carpet and furniture. However, he is very cute and we love him. Biff joins the team as Head of Security and Entertainment and we're sure he'll reach the dizzy heights of fifteen inches. Now, how long will it take for him to become stuck in a hole somewhere ? 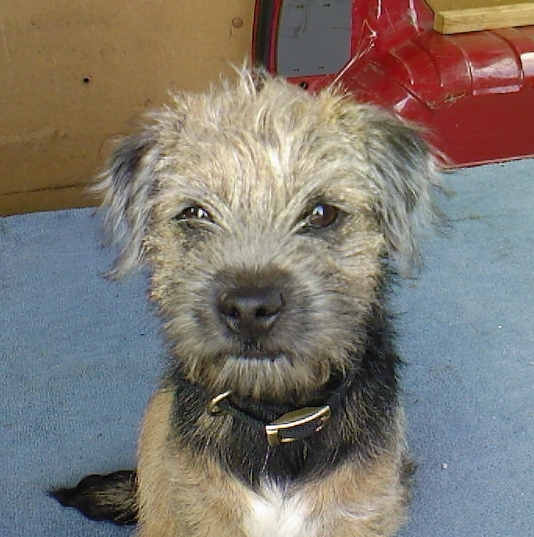 Biff has successfully completed his 3 month probationary period, we like him, so he stays. He has shown a keen eye for details and has an exemplary taste in music with Paul Rogers being his favourite vocalist and Steve Marriot not far behind. When Biff isn't hard at work, he enjoys hangliding and a little white water rafting. His favourite food is Indian with any old bottle of red wine. 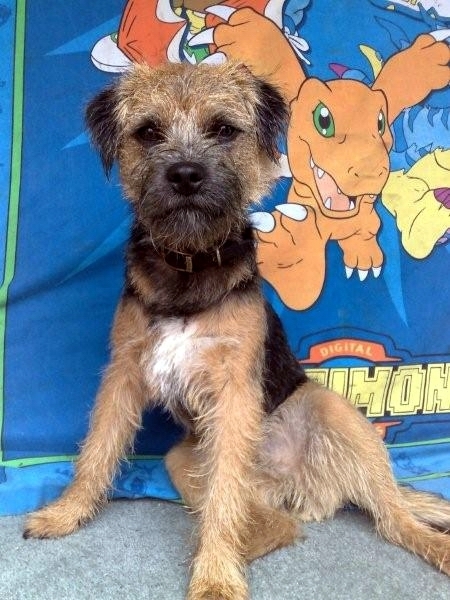 Biff has many endearing thingies and always has a lick and a wagging tail for people, even on a 'bad hair' day. and Biff afterwards, yes, I know what you're thinking ! The last week or so has been particularly tough for Biff, normally he can be found in his favourite seat at Molineux watching his beloved Wolves playing the beautiful game. He is however an ardent England fan also and as we all know England failed to make the finals of Euro 2008. This has not stopped Biff wearing his England shirt with pride whilst watching the Finals and his mood has lightened considerably and laughter can be heard again as he watches France's abject displays, in fact he hasn't stopped laughing at France. Biff it can be said, is not a Francophile ! 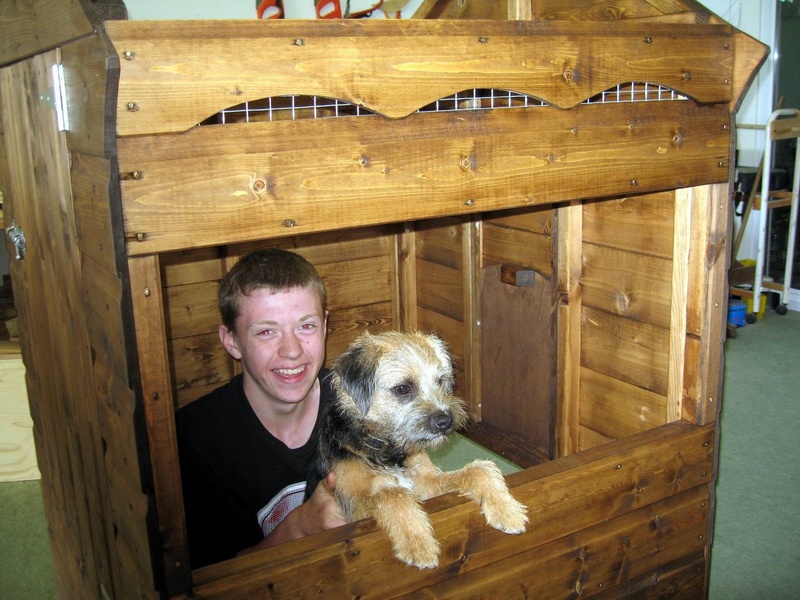 We've recently had a couple of visits to our workshop from a pair of bright young men who as part of a school project, wanted to make their own Hen House. Biff took it upon himself to entertain and make sure safe practices were used at all times, his critical eye and tough discipline made sure that the Hen House made by Alex and Sam is something they should be proud of. Biff with the boys inside the Hen House....don't ask. Ever the joker, Biff decided to get involved in Red Nose day and made himself the biggest Red Nose ever, he is so silly sometimes. Biff is the proud owner of his own seat at Molineux where he watches his old gold and black heroes, I actually think that he prefers a hot dog and a beer before the game. You can't do the job without the proper tools, right Biff ? 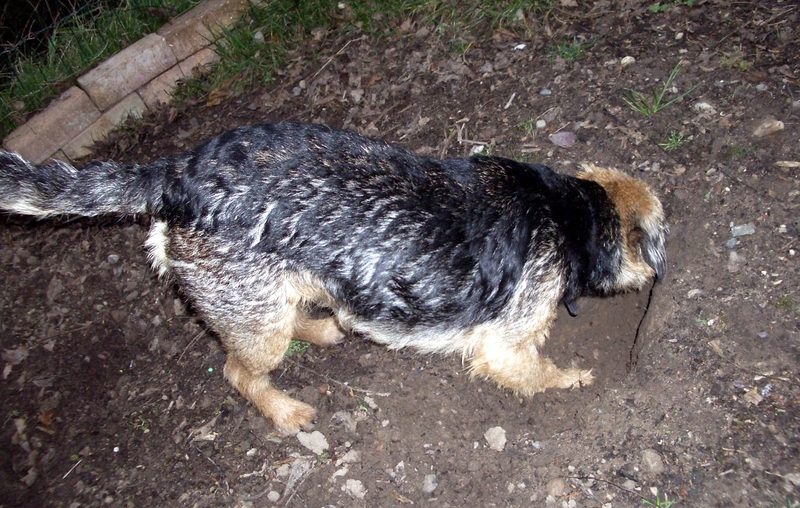 Biff loves digging, good job he has green paws. Biif has been off work for two weeks, the vet said it was a 'minor' operation, Biff wouldn't agree. Thankfully he's on the mend now and we hope that the paperboys leg who Biff fell in love with, is healing too. As a way of saying sorry, I bought Biff another of his favourite strings, I think I'm going to be paying for a long time. Biff is one today. He helped in the garden collecting leaves and things...not. Then we had a party for him with teacakes and cider, I love tea cakes, and cider. Unfortunately Biff isn't allowed either, oh well. Happy Birthday Biff. Most dogs prefer a basket to relax in, Biff prefers a window ledge, we think he's just nosey. The main reason Biff loves to spend so much time looking out from his window ledge is ....Rats ! From his sentry position he can spot rats stealing food from the birds and animals then go pounce, he's very good at his job and the problem we've got is that he knows it and has asked for a pay rise. I hate it when he stares me out, usually as I'm about to have stern words with him. Why do I feel guilty ? It was inevitable that Biff would gain our love of music, what I hadn't planned on was Biff gaining my guitars ! He says his playing style is a cross between Rory Gallagher and Paul Kossoff, I say whatever.